On Christmas Eve, 1842, near Benton Alabama, Reverend and Mrs. Henry Fullingim welcomed their 17th child, Jesse Perkins Fullingim, to their fold. Neither Rev. 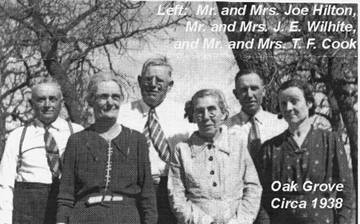 Fullingim nor his wife Martha had any idea this son Jesse, along with his older brothers Edward and Archibald, would play a pivotal role in the history of a small rural church in Wise County, Texas, hundreds of miles from their ancestral home. 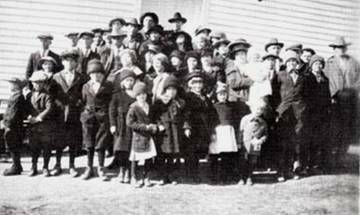 The Fullingim family migrated to East Texas, settling in Hopkins County, where Rev. Fullingim continued his ministry in the Methodist Church. The older boys continued westward, settling in Wise County as early as 1850. Archibald, a surveyor, and Edward, a minister and farmer, had settled along Black Creek where Edward had received a land patent for 160 acres. In 1860, Jesse joined his two older brothers and settled near Decatur. The Civil War interrupted their lives, and both Edward and Jesse answered the call to serve honorably in the Confederate forces from Texas. During that bloody strife, the brothers witnessed atrocities on both sides. In fact, Jesse suffered the loss of one eye at the Battle of Chickamauga. Four years later in 1878, Edward, the minister, along with Rev. Jim Smith, organized Oak Grove Methodist Episcopal Church South. The name was chosen for the grove of oak trees nearby and for the Methodist Episcopal Church South which had split from the Methodist Episcopal Church of the North over the issue of slavery. In 1880, Oak Grove became a part of the Decatur Circuit, with Rev. R. N. Brown as its first regular pastor. In 1902, a brush arbor was built closer to town on this very site. It was the son of the third brother, the surveyor Archibald, who gave the land on which our current sanctuary now sits, three miles south of its original location. These three Fullingim brothers, Edward, Jesse, and Archibald, left a Christian legacy that continues to inspire and sustain people on their journeys of faith today. One of their descendants, Rev. J. Michael Fullingim, is a Professor of Divinity at Oklahoma Wesleyan University. Ironically, none of the brothers were buried in the Oak Grove cemetery they were so instrumental in creating. The minister Edward is buried in Bailey, Oklahoma, while both Jesse and Archibald are buried in Oak Lawn Cemetery, just over the hill from Oak Grove. 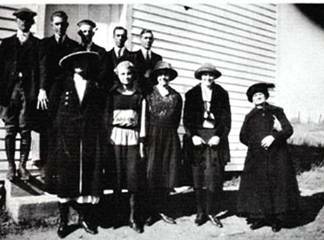 According to historical accounts, Methodists were the first to bring Christianity to Wise County as early as 1852. The earliest known preacher was Rev. W. H. H. Bradford, a Wesleyan minister. The Baptists were not far behind though. Most of the religious gatherings were held in brush arbors in the summer and in individual homes during the winter. No proper church building existed in the area until after the Civil War. 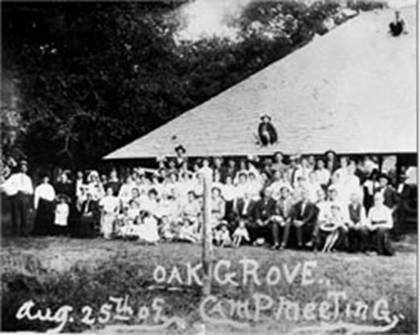 The first Oak Grove building was a wooden one-room structure near the cemetery, just north on Greenwood Road. 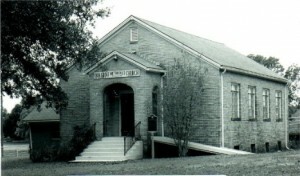 In 1880, Oak Grove became a part of the Decatur Circuit, with their first regular pastor, Reverend Richmond Nolley Brown. Rev. Brown, who had also been wounded in the Civil War while serving in the Confederate Army, served from 1880 to 1881. In the summer of 1902, the members built a brush arbor here on this lot, closer to town. And much like all Methodist building projects, a controversy arose. Ironically though, the controversy was over the purchasing of a new pump organ for the brush arbor. One member had objected, saying that the organ was an “instrument of the devil, and he didn’t believe they should have it in church.” Thank goodness, others persisted, and a new pump organ was purchased. The rest, as they say, is history. And that’s the gospel truth! In the fall of 1902, after the congregation had built a brush arbor here AND purchased the new pipe organ, the original wooden church building was moved from its first location to its new place here on these grounds. It was a one room structure with a seating capacity of about 100 people. 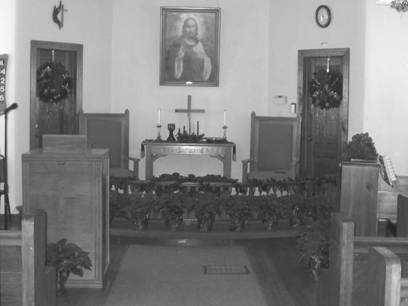 Within a few years, the brush arbor was replaced with a new tabernacle. One of the first services held in the tabernacle was the funeral of Martha Wilton in August 1905. 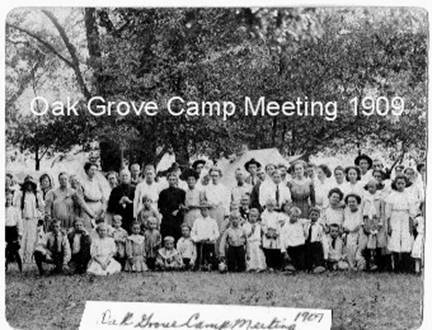 In August every year for many years afterward, hundreds of people would come to Oak Grove for a Camp Meeting, bringing their tents and supplies, camping under the oak trees for ten days at a time. With the advent of the automobile, the camping ceased, however. After World War II ended, Reverend J. G. Forester suggested that it was time to build a new church building because the wind kept coming up through the cracks in the floor and around the windows. The congregation agreed and began planning a new building. Originally, church members wanted a rock building, but a brick mason suggested they use brick because it was stronger, making the construction of the structure easier and cheaper to build. Emory Don Hilton, the primary architect, contacted the Methodist Church to see about getting a grant to help pay the cost of the building. 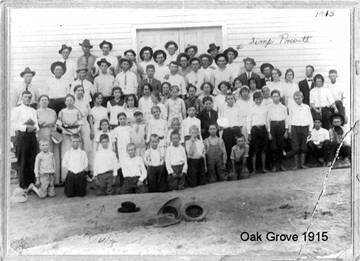 After settling some legal problems with the deed for the land, the Church gave Oak Grove a grant of $1,000. In 1948, a building committee and a financial committee was formed, with Charles Wilhite as the chairman. After excavation of the land adjacent to the original building was completed, church members began tearing down the old building. Night after night, groups of men met to mix and pour concrete. The women and children gathered for nail-pulling parties. All the good lumber from the old building was used in the construction of the new one. Even the pastors at the time, Rev. J. C. Sprouls and Rev. Carlton Thomson worked alongside the rest. Mr. Skinny Snipes and Mr. Albert Harder were the lead carpenters, and Mr. Grady New helped set the basement forms. Mr. Skinny Snipes did all the plaster work, with the help of master plaster mixer, Fred Snipes. The only work not done by the members was the brickwork, saving the church over $4,000. During the following year, services were held in the tabernacle until the weather got too cold. Then for a few Sundays, services were held in the Joe Hilton home, until the weather warmed up again. 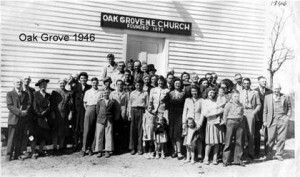 The first service in the new building was held in November, 1949, complete with special music by the Oak Grove Quartet and BBQ on the grounds afterwards. The building was formally consecrated on May 20, 1951. There was only one charter member still living: Mrs. P. L. Wade. The total cost for the new building was $8,950, but the estimated value of the church was $15,000. The total indebtedness to the Methodist Church was $1000, but the beauty of the new building was well worth it. Only one problem existed with the new building. There was no water or indoor plumbing at the time, so members had to use the “outdoor facilities,” which still stand near the playground today. The concrete steps to the original building that was torn down are now located in our Prayer Garden just north of Fellowship Hall. And if you look in Fellowship Hall, you will see a nail that was found while members tilled the flowerbeds a few years ago. We think it is one of those original nails pulled by the women and children. 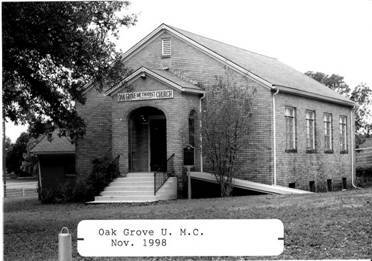 From 1951, when the current sanctuary was consecrated, to the present day, Oak Grove has endured some difficult times. In 1968 church membership was 68, with an average worship attendance of 34. There were 10 youth in the congregation. Ten years later, when the church celebrated its centennial anniversary in 1978, church membership had dropped to 32, with an average worship attendance of only 14. There were no youth at all then. In fact, there were no youth at all for 11 years, from 1974 to 1985. In 1983, the church built a ramp to the sanctuary and erected new road signs to help build membership. Interestingly enough, the pastor’s monthly salary was only $130 then. 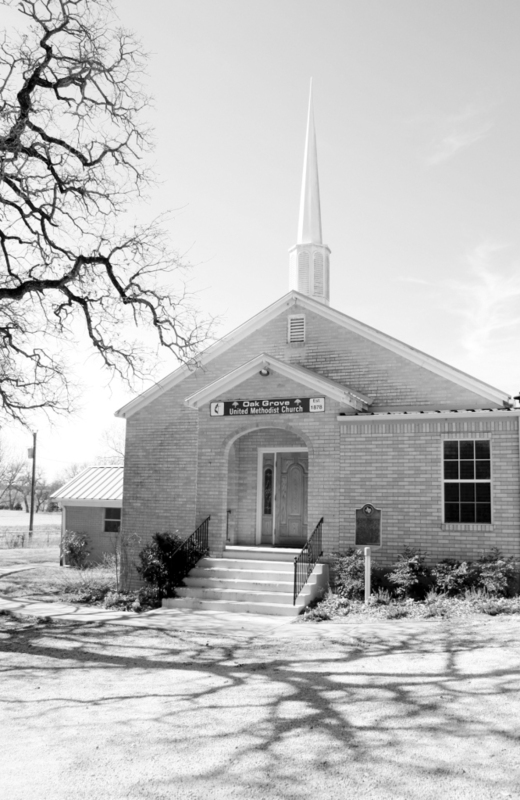 In 1984, through the efforts of church historian Alta Mae Cook and Charles Wilhite, the church was recognized as a Texas Historical Site by the Texas Historical Commission. A marker was placed outside the sanctuary, commemorating its rich heritage. By 1988, church membership was down to 29, with an average worship attendance of 12. But there were 6 youth at that time. One of the goals that Pastor Terry Johnson had for that year was to establish a regular time for communion. He and Charles Wilhite also started a weekly visitation program for members and non-members in an effort to rebuild the church. Their efforts paid off because in 1989 the church received 8 new members. There were now 35 members, with the average worship attendance of 20. However, no one attended Sunday School. It was that same year 1989 that the church was finally air conditioned. 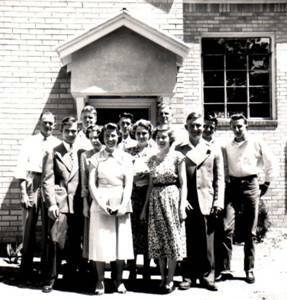 In August 1990, on behalf of the members of Oak Grove, Charles Wilhite requested and received a $5,000 grant from the North Texas Conference of the United Methodist Church. Current member Lila Reed served on the Finance Committee to raise another $5,000 for a building project. On October 27, Oak Grove celebrated its 112th Anniversary by having a barbecue and auction to raise the money to dig a water well, put in indoor plumbing, and install restrooms. Lila was the chairperson of the Nurture and Care Committee and Pastor Johnson said of her, Lila “has done a fantastic job this year. She sent out over a hundred cards and letters.” Her work paid off because the church was able to raise the $5,000 needed to begin the improvements. In 1991, the floors in the sanctuary were refinished and new Venetian blinds and ceiling tiles were installed. In 1993, numerous families from all over the nation contributed money to the Oak Grove Improvement Fund in honor of their friends and family. Plaques commemorating their gifts can be seen throughout the church. As a result of all the donations, water was made accessible to the Tabernacle, a kitchen was constructed in the basement, a new ramp to the sanctuary was built, and Pastor Kathy Fretwell reinstituted the 5th Sunday Dinners on the Ground. 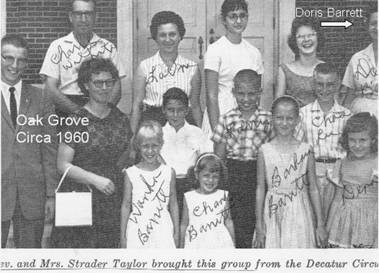 In May, 1996, with only 9 or 10 members actively worshiping at Oak Grove, the District Superintendent called a church conference to discuss disbanding the church and transferring its memberships to First United Methodist Church in Decatur. Such had been the fate of Greenwood United Methodist Church in the summer of 1981. There had been talk of using Oak Grove as a youth center for First United Methodist Church, but when Pastor Kathy Fretwell informed the faithful few about the proposal, the members protested. Because they rallied all their neighbors together and rededicated themselves, the church was left intact, and a new minister was hired. On Father’s Day in 1996, Pastor Bill May preached his first sermon at Oak Grove. It was a momentous occasion for the church. The faithful dedication of a few members revived Oak Grove’s heritage, not letting it end so unceremoniously as other rural churches had. Through the guidance of Pastors Bill May and Gene Chamness, membership increased over the next few years, and the church became a vital part of the community once again. 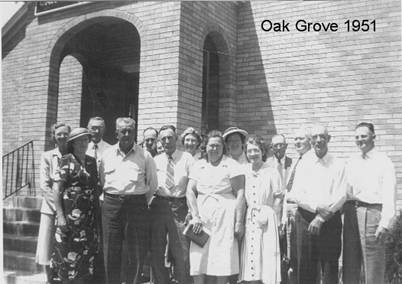 In 1998, Oak Grove celebrated its 120th Anniversary, with current member Frances Cason chairing the committee that planned all the activities for the special event. 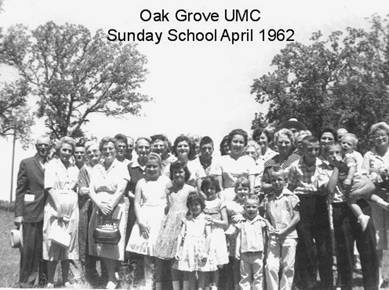 Oak Grove had endured and was once again continuing its long history of Christian discipleship that had begun so many years ago along the back roads of Wise County. By the time the new millennium arrived in 2000, Oak Grove was growing and thriving. Through the dedication and hard work of its members, the church experienced a rebirth that continues today. In 2001 members of the church broke ground on a new Fellowship Hall and Education Building. Again the members of the church donated their time and expertise to do much of the construction themselves. The building was completely paid off one year later, and on May 18, 2002, the members dedicated and consecrated the new facilities, which included a pastor’s office, classrooms, kitchen, and a large dining hall. The historic sanctuary was finally complete that same year when Lila Reed donated a steeple in memory of her late husband, Jesse Parish Reed. 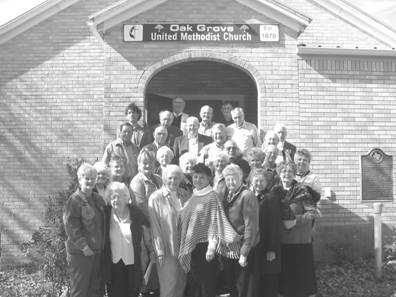 Oak Grove formally entered a new age in 2002 when its website www.oakgrovemethodist.com was launched on the internet. In 2003, the old Tabernacle was rebuilt, and the historic pews were freshly painted. 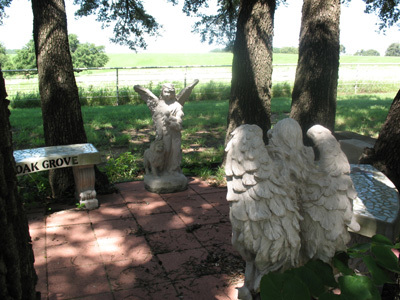 In 2004, the Oak Grove Prayer Garden was created. In 2005, members began plans to erect a new Children’s Playground, and in June of that year, as Reverend Fredric Utz became pastor, the members of Oak Grove were led to continue their goal to grow in membership, with a hope of reaching young families. In May 2008, membership stood at 75, with an average worship attendance of 46. Eleven of the members were youth. These are the highest numbers the church has had in over 50 years. The church celebrated its 130th Anniversary that year with a day full of activities and fun. TO SEE A LIST OF OUR FORMER PASTORS, CLICK HERE. 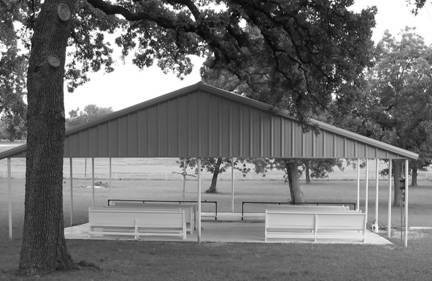 *A new basketball court was built adjacent to the Tabernacle as a memorial to Barbara Rhine. *Josie and Joe Reppeto donated new sliding doors for the Fellowship Hall. *A new sidewalk was laid to the Tabernacle, and Lila Reed donated the handrail alongside it. *Kerry Wilde painted murals in the nursery and children’s Sunday School room. *Patti Mahaffey made two new banners for the sanctuary. * Vicky and Ron Solomon donated brass candleholders and offering plates in memory of Vicky’s parents, Jean and Charles Keyworth. * Walter and Mary Jo Pac donated a podium for the tabernacle and a wooden Methodist logo for the sanctuary. * The daughters of Mr. and Mrs. T. F. Cook (Martha Hickey, Bonnie Rawlings, Norma Wiley, and Joyce McNeill) donated the front door to the sanctuary in memory of Leonard Cook and Col. U. R. Rawlings. * Ed Maddox donated the ceiling fans and lights in the sanctuary in memory of his wife Movelda Maddox. * Lila Reed donated the steeple atop the church in memory of her husband Jesse Parish Reed. 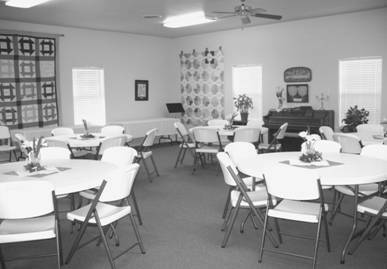 * Sue and Ed Harris donated a piano for use in the fellowship hall. * Numerous people donated to the Improvement Fund in honor of their friends and family. The money was used to build new bathrooms and repair the roof and ceiling. 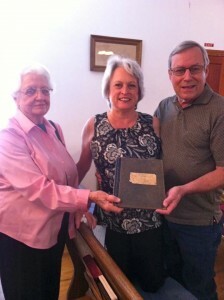 * On Dec. 9, the Texas Historical Commission recognized the church with a Texas Historical Marker. * Mr. and Mrs. C. R. Henderson (parents of Carrie Lou Shields) donated a clock in the sanctuary. * The children of Mr. and Mrs. Joe Wilhite gave a new piano to the church in memory of their parents. * Mrs. Louis Browning donated a picture of Christ in memory of her parents Mr. and Mrs. J. R. Moore. * Mrs. Louis Browning and her parents Mr. and Mrs. J. R. Moore donated the altar rail. * Mr. and Mrs. M. L. Holt donated the Sunday School Attendance Board. * Rev. Carlton Thompson donated the podium in the sanctuary. * Other donations include the wooden cross on the altar/communion table, which was donated by Bill May. * A plaque in memory of Howard L. Hall was placed on the door of the old kitchen.